ConductRF's FPA RF Cable Assemblies provide a cost effective high performance solution for applications typically supported by Semi-Rigid or high cost flexible precision cables. Our Multi-layer shielded cable provides both flexibility and form-ability by combining a flexible spiral foil over which is a tin plated copper braid which can be formed. This create a half-way situation, but with added benefits of lower costs, improved performance and enhanced shielding. 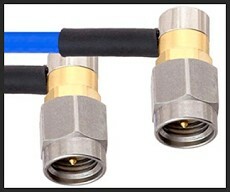 FPA Cables are available on short lead-times with custom lengths and configurations. Precision SMA, 3.5 mm, 2.92 mm & 2.4 mm are our most common standards. All finished assemblies are 100% validated through VNA testing prior to delivery to factory or customer defined performance standards. 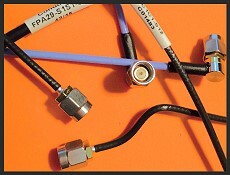 Using our Low Profile 27 GHz SMA "Swept Cable" configurations, ConductRF can provide R/A Assemblies with no VSWR drop when compared with equivalent straight connector solutions operating up to 27 GHz. It is common to produce R/A Assemblies with VSWR of 1.20:1 or better. ConductRF provides two standard cable size options using our own cable; A28RFJ(ø0.086") & A29RFJ (ø0.141"). These cables are built to with Multi-layer shielding consisting of a silver plated spiraled tape layer over which is a tin plated copper braid. Oxygen Free High Conductivity copper is used for Conductor and braid layers to maximize performance. Along with a Low Loss laminated PTFE dielectric and an FEP Jacket, assemblies built with these cable can operate with high stable performance in temperatures up to 125ºC. 1. Using our two common cable types, let us know if you want an FPA28 (ø0.086") or FPA29(ø0.141") cable. 2. Then describe your preferred connector range selection and configuration. 3. Finally describe the length in the units of your choice. Find Much More at www.ConductRF.com ConductRF offers two complete range of RF Connectors for Commercial & Mil/Aero applications. With a wide array of cable assembly selections using ConductRF can help narrow down your needs to the perfect solution for System of Test. Go to www.ConductRF.com and see our full range of capabilities. Alternatively email us with your requirements and we will get back to you within 24 hours with your solution. Note: LMR is a Times Microwave System Trade Mark. ConductRF exclusively uses Times Microwave LMR products in the manufacturing of this series of cables.